A contentious land swap involving park space in Oliver has residents divided. 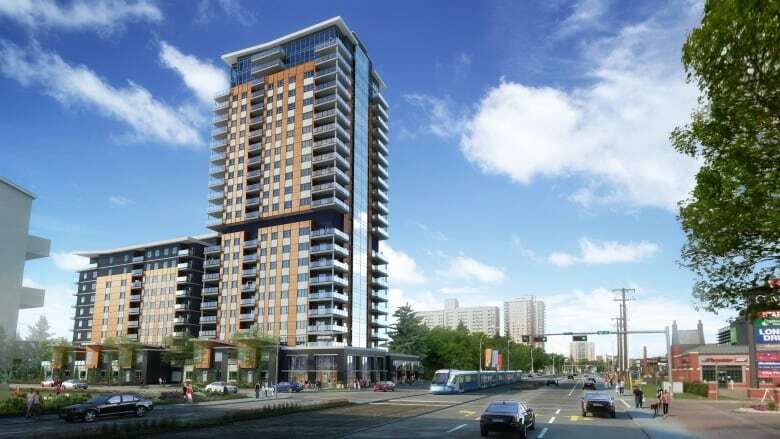 Abbey Lane Homes has proposed purchasing the northeast corner of Oliver Park at 104th Avenue and 118th Street to develop a 24-storey residential high-rise. In exchange, the city would receive a similarly sized plot of land directly south of Peace Garden Park, in the former site of the St. John's Catholic School on 120th Street and 102nd Avenue. The community had the chance to review the proposal Tuesday night at a drop-in meeting at Robertson-Wesley United Church. While the idea for the land swap came from a resident and received some support at a previous meeting in January, some residents at the drop-in were not enthused. "I just think it's a terrible idea to put a building in one of the few park spaces we have in the neighbourhood," said Sandy Tomlinson, who has lived in Oliver for eight years. The 104th Avenue corridor, which will eventually accommodate the Valley Line West LRT, is short on park space, according to city plans. "Trading a mature park full of trees … for basically a derelict building site that's going to need to be completely redeveloped into park space is not a good deal," Tomlinson added. Oliver Park is also home to a single-sheet ice rink and a community pool. City plans going back to 2008 have considered shutting down the rink, and some residents fear the pool will be a target as the city considers cutting its operating budget. Tomlinson said the community has been put "in limbo." The developer proposed a 14-storey building on the St. John's site in March 2017. Some community members said the building was too tall for the interior of the neighbourhood. Others feared it would cast a shadow and ruin the community garden just north of the site. A resident suggested a land swap at an open house in September 2017. The city reviewed the technical feasibility of the swap and Stantec, the design consultant for the developer, submitted an application proposing the move in March 2018. Oscar Rutar, construction manager with Abbey Lane Homes, said the revised application is "a win-win for the community." "They get the park in the middle where it's quieter," he said, referring to the St. John's site. "And the residential gets built closer to LRT tracks, the high traffic and the shopping." "I know the community is divided," Rutar said. "You can't ever satisfy everybody, but I think it's important that density is built close to the LRT." Abbey Lane Homes has pledged to plant 55 trees on either the St. John's site or in Oliver Park to replace the roughly 25 trees that would be removed for construction. It has also set aside $55,000 for a community league building, after the nearly century-old building was torn down due to rotting in early 2017. Community league president Lisa Brown said the residential tower could preclude her idea to turn parts of Oliver Park into a recreation centre or a library. The neighbourhood is served by the Commonwealth Recreation Centre, more than four kilometres away, and the closest library is the downtown branch. "Giving a portion of Oliver Park without knowing the full repercussions of that to Oliver and the city long-term would also be very shortsighted," Brown said in an interview with CBC News before the meeting. Pawlyk, the senior planner, said the issue of a recreation centre had been raised with colleagues in other branches of the city. He concluded that "any number of facilities that we envisioned on this site could be accommodated in the remaining and the balance of land" in Oliver Park. The 24-storey tower would step down to 10 storeys along 118th Street with townhouse style units at street level. The building could accommodate between 225 and 280 residential units, with commercial space facing 104th Avenue.